We watch ALOT of animated stuff in this house (probably another reason I feel like my brain is turning to mush)...and when I looked at dinner tonight, then realized my camera battery is dead..even though I knew/know it's a great recipe and you guys will love it...you'll have to trust me b/c we're sans picture, mmk? 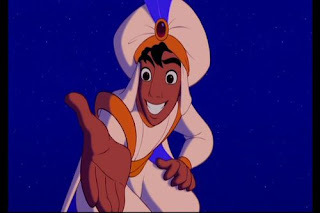 Hence Aladdin and his "do you trust me?" pose. Swoon...I'd like to go on a magic carpet ride....if I could sleep the entire time. Mamacita is tired..stomach flu has hit and hit hard...but hey..should give me a step up on next weeks weigh in right? Ah..it's the little things! Have some oil heating in a pan-dredge your steaks, shake off the excess and put them in the pan...brown on both sides (but don't worry about cooking all the way through). I let mine go for 6 hours. No really...LOW and SLOW. Don't turn up the heat,don't pull it out early...just let it go. This could totally be crockpotable too! The result? FALL APART beef and a delicious mushroom and chile gravy. Nom nom! Since I'm dieting I just ate some of the steak...the kids had steak AND mashed potatoes. SERIOUS test of strength to feed Lil Man potatoes and not eat some myself. Oof!